The Lae Chamber of Commerce Inc has introduced a benefits program allowing all members access to exclusive promotions and discounts offered by fellow LCCI members and other PNG and Australian businesses. Access to the benefits program is open to LCCI members only and requires a membership card. 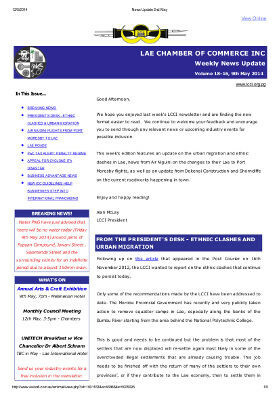 For further information or to access the benefits program, contact the LCCI media department. Airways Hotel, Port Moresby – From K750 per night for a Bacchus Room. For further information or to find out how to book, click here. Hydraulink Niugini – 10% discount on Labour, 10% discount on parts to all LCCI members and employees. Includes free pick up/drop off from their Malahang depot. Lae Traveller’s Inn – From K120 per night, which is over 45% off the rack rates. For further information, including the different room rates, click here. Shangri-La, Cairns – From $180 per night (Incl GST) for a Superior Garden/Pool/City View Room, which is more than 50% off rack rates. For further information or to find out how to book, click here. Novatel Cairns Oasis Resort – offers 10% off their best Online Accommodation Rate as well as free Nespresso Coffee Machine for meetings. For further information or to find out how to book, click here.